Tripping on cables, charging the Gel Cells, cutting the radials, pining for proper propagation reports..it's Field Day 2017. Been preparing all week. I think my wife and daughter are more than happy to have me out of the house at this point. "So honey, if you setup at 1:00 you can play with your radio the whole 27 hours? That sounds good, you deserve to get away"
Gone will be the RG213 and RG 58 strewn about. Relieved they will be of the "Honey can you hold the end of the wire?" "Keep it tight" I have been promising all week that the mess in the house will be taken care of tonight. I have been saying that all week, each afternoon. So now I am putting it together. I will be solo this FD. On Siesta Key Beach! The Number 1 Beach in America according to Trip Advisor. I have scoped out a spot. The county folks were friendly but stopped just short of giving me a permit to operate the full 27 hours. 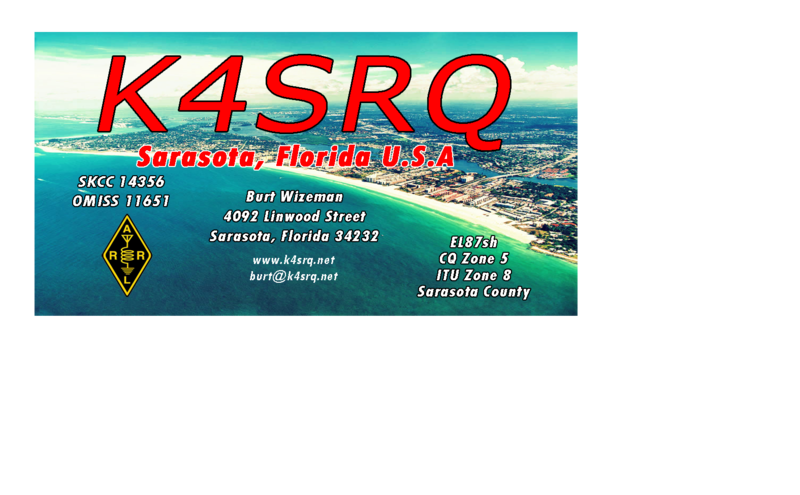 So if you want a QSO from a QRP operator at the Number 1 Beach in America, look for KI4FH - KI4 Florida Hotel on 20 and 15 at day and 40 at night. I will be on the QRP voice and QRP CW sections.